Railpictures.ca - Daniel Odette Photo: Though Via Rail essentially abandoned Niagara over 6 years ago now, they still find their way around. Whether it be providing a rescue unit to help the ailing Amtrak Genesis units on the Maple Leaf, or running charters, it’s not a once in a blue moon occurrence. Via 6435 leads chartered train 698 through Vineland en route from Niagara Falls to Toronto. The train stopped in St. Catharines to pick up Canadian legends Geddy Lee and Alex Lifeson, part of the band Rush. Neil Peart unfortunately hasn’t been able to keep up with two of them. He wasn’t on the last charter four years ago either. The last time, this train was lead by Via 909, in what ended up to be a humiliating photography learning experience. I was unable to attach my lens in time for a sufficient photo, so it’s good to get a second chance. I don’t opt for far in zoom shots often, though it was quite interesting here. In the distance is the signal for the Jordan control point where the Grimsby Sub returns to double track, a full 2.5 miles away. Even further back, in front of the Niagara escarpment backdrop, somehow visible is the water tower at the Welland Canal. The tower is at control point Seaway, about 11 miles away. While by no means level east of Jordan, this photo illustrates just how straight the Grimsby Sub is. There are multiple lengthy sections of perfectly straight track on this subdivision, though this section between east Grimsby and Seaway is the longest at 17.8 miles. The other reason the water tower is likely so visible is the elevation is 130 feet higher than here. To get there is a stretch of multiple large dips that without a doubt wreak havoc on CN’s monstrous trains 421 and 422 on a fairly common basis. A telephoto zoom shot on a ladder would be pretty fitting here. Despite how straight the Grimsby Sub is, Geddy, Alex, and whoever tagged along with them, will trundle down the Grimsby Sub at an uninspiring 65mph, easily eclipsed by the vast majority of traffic on the QEW. Though, maybe they can still write a song about their slow train ride through the wine fields of Vineland. If Geddy and Alex make this trip again in four years, they will likely be greeted with solid double track the entire way, perhaps with speeds peaking 80-100mph. Time will tell. | Railpictures.ca – Canadian Railway Photography – photographie ferroviaire Canadienne. Copyright Notice: This image ©Daniel Odette all rights reserved. Caption: Though Via Rail essentially abandoned Niagara over 6 years ago now, they still find their way around. Whether it be providing a rescue unit to help the ailing Amtrak Genesis units on the Maple Leaf, or running charters, it's not a once in a blue moon occurrence. 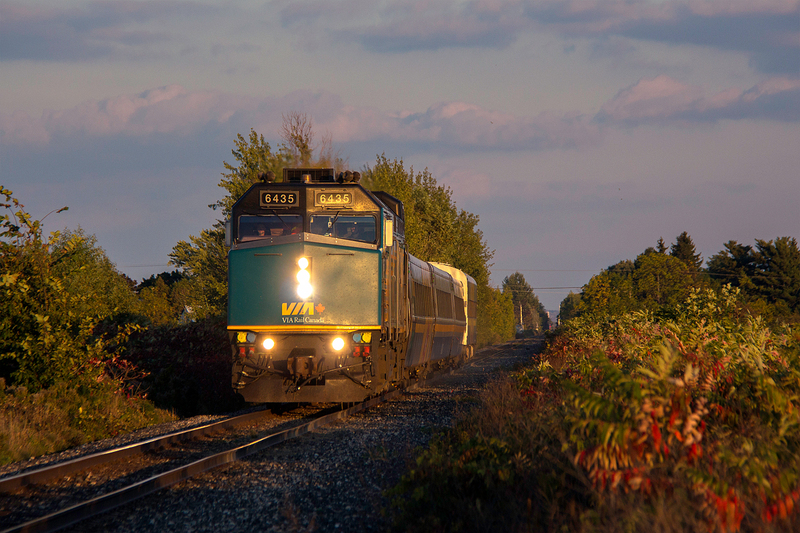 Via 6435 leads chartered train 698 through Vineland en route from Niagara Falls to Toronto. The train stopped in St. Catharines to pick up Canadian legends Geddy Lee and Alex Lifeson, part of the band Rush. Neil Peart unfortunately hasn't been able to keep up with two of them. He wasn't on the last charter four years ago either. The last time, this train was lead by Via 909, in what ended up to be a humiliating photography learning experience. I was unable to attach my lens in time for a sufficient photo, so it's good to get a second chance. I don't opt for far in zoom shots often, though it was quite interesting here. In the distance is the signal for the Jordan control point where the Grimsby Sub returns to double track, a full 2.5 miles away. Even further back, in front of the Niagara escarpment backdrop, somehow visible is the water tower at the Welland Canal. The tower is at control point Seaway, about 11 miles away. While by no means level east of Jordan, this photo illustrates just how straight the Grimsby Sub is. There are multiple lengthy sections of perfectly straight track on this subdivision, though this section between east Grimsby and Seaway is the longest at 17.8 miles. The other reason the water tower is likely so visible is the elevation is 130 feet higher than here. To get there is a stretch of multiple large dips that without a doubt wreak havoc on CN's monstrous trains 421 and 422 on a fairly common basis. A telephoto zoom shot on a ladder would be pretty fitting here. Despite how straight the Grimsby Sub is, Geddy, Alex, and whoever tagged along with them, will trundle down the Grimsby Sub at an uninspiring 65mph, easily eclipsed by the vast majority of traffic on the QEW. Though, maybe they can still write a song about their slow train ride through the wine fields of Vineland. If Geddy and Alex make this trip again in four years, they will likely be greeted with solid double track the entire way, perhaps with speeds peaking 80-100mph. Time will tell. Thanks guys! Phil, you’d know better than me. I always figured the dip was notorious as several trains have broken knuckles there in the past. I guess it’s not as common as I thought. I do remember the curve is around the former Book Road crossing in Grismby. Once eastbounds round it, I can often see them as far away as St. Catharines. I guess I was vague in my description of the tower. The blue domed water tower next to the canal I’m pretty sure is what’s in the picture. I have a fairly clear image of it from Jordan as well. I wasn’t aware GM owned it. Makes sense though. Good stuff, Daniel. Nice story to go along with the pic. Very awesome shot Daniel! Perfect lighting. Actually once 422 gets past the mandatory 25mph over the canal its pretty smooth sailing across the mostly straight Grimbsy Sub. There is a curve just leaving Grimbsy station towards Jordan but it straightens out quickly. Hey Docta. I don’t think that is the Seaway tower. It looks like it might be the corner of the water tank at the GM plant in St Kitts. Is that the Seaway tower you can see in the background?